The staff was pleasant. The shows were excellent!! !Some of the best we've ever seen while on travel. The property's restaurants( other than breakfast and the dinner buffet) were very disappointing. The food was not very good and on two occasions we had to stand in a long line to get into the restaurant that was in fact one of the only two open for dinner on this particular night. Horrible check In and out Bad pools Worse food After 24 visits to Cancun. This is by far the worst property I have ever encountered. 24 times I’ve been there over 20 years. Horrible resort I have no idea how they get the rating they do. You get what you pay for! Pretty good hotel for this price! No complaints! Staff is friendly and accommodating! Would stay again! I loved the view, Everyone was very nice, happy and helpful. The entertainment staff was awesome. loved the shows. This is a Beautiful property with friendly and fun staff. The Shows were great also. We will definitely be going back ! A few changes since the last time I reviewed this hotel in 2016: The policy is that they now do not serve any alcohol until 11 AM. Also, the drink cups were smaller this time, instead of the larger cups, they now serve most drinks in a very small 5 oz cup. Everything was really nice. We enjoyed our stay. Rooms. Rey clean an spacious. The property is very nice, a bit on the small side but we didn’t want one of those gigantic resorts!. We had a nice, king bed room facing the ocean so that was a plus. The red flags on the beach were out every day so no swimming only wading as the water was rough. The staff were friendly and attentive. Our beach and pool bar waitress, Odely, was fantastic! She was always smiling and very much focused on providing excellent customer service! The food was average and we filled up at breakfast as the poolside lunch was not good. Do eat at Marco Polo as much as possible... food and service both very good! Other than the lobby bar there’s not much else going on at night but we were happy to include rest in our vacation too! The 83 and sunny weather was enough to make the stay overall enjoyable. Internet service needs to be upgraded. No service at poolside. The service was amazing, however the food was not the greatest. Great staff but room was not the best since we were on the first floor. Located in Zona Hotelera, GR Solaris Cancun & Spa - All Inclusive is within a 10-minute walk of popular sights such as Delfines Beach and El Rey Ruins. This 306-room, 4-star property has 2 outdoor pools along with a marina and 7 restaurants. There are multiple options for onsite dining with 7 restaurants, including Cafe Solaris, which has pool views. Savor a meal from the comfort of your room with 24-hour room service, or get a quick energy boost at the coffee shop/café. An LED TV comes with cable channels, and guests can stay connected with free WiFi. The bathroom offers hair dryers and free toiletries. Other standard amenities include a balcony, free minibar items, and a coffee maker. 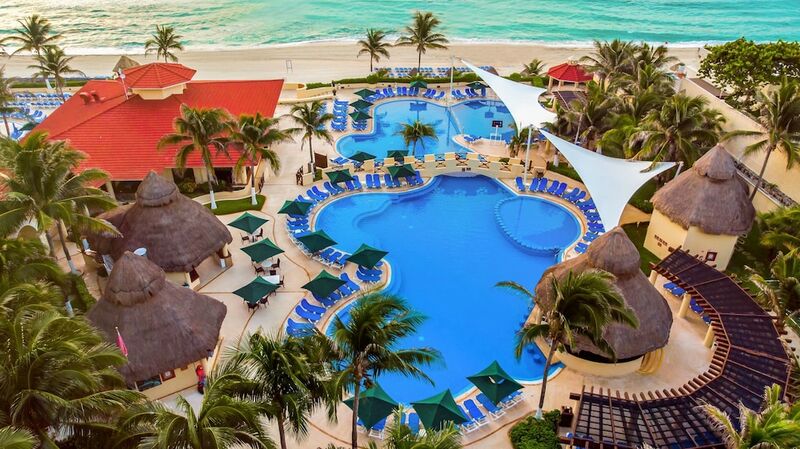 Guests of GR Solaris Cancun & Spa - All Inclusive have access to a marina, 2 outdoor pools, and a children's pool. If you drive, take advantage of free valet parking. The front desk is staffed 24 hours a day to help with tours/tickets and luggage storage. Other amenities at this all-inclusive property include a health club, a spa tub, and a steam room. Cafe Solaris - Restaurant with pool and garden views. Open for breakfast. Kid's menu available. Open daily. Marco Polo - Pool-view fine-dining restaurant specializing in international cuisine and serving dinner. Kid's meals available. Open daily. Reservations required. Rosmarinus - Restaurant specializing in international cuisine and serving lunch. Ocean and pool views. Kid's menu available. Open daily. Cinque Terre Pizza - Bistro specializing in pizza and serving lunch. Ocean and pool views. Open daily. Deli - Poolside delicatessen open daily. GR Solaris Cancun & Spa - All Inclusive features a marina and a health club. The property has 2 outdoor swimming pools and a children's pool. A spa tub, a steam room, and a fitness center are other recreation options. The preferred airport is Cancun, Quintana Roo (CUN-Cancun Intl. ): 15-min drive, 8.3 mi/13.3 km. This property does not allow early check-in. For more details, please contact the property using the information on the reservation confirmation received after booking. A cash deposit or credit card for incidental charges, as well as a government-issued photo ID, are required at check-in. The hotel advises that room view requests made during booking are subject to availability at check-in. All payments made by American Express credit card applies a 5% fee in case of cancellations and/or refund. For more details, please contact the property using the information on the reservation confirmation received after booking.